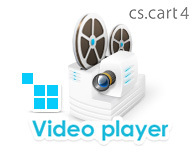 We ported CS-Cart Video Player module to the latest version of CS-Cart. Now it is compatible with CS-Cart 4. It has new cool features and enhancements. Add-on has a global adding video to products. You can learn how it works on the video tutorials. Please see videos for Video player add-on bellow. Stay tuned for more news on cs-cart plugins updates. This entry was posted in CS-Cart addons and tagged cs-cart addons, cs-cart modules, cs-cart product video, cs-cart video manager, cs-cart video player. Bookmark the permalink.